At Suburban Furniture, we carry several different brands of furniture and we know it can be hard to make an informed decision about which brand is right for you. We thought we’d help you out by giving you a little more information about each brand. Now you’ll be able to have brand information in one place rather than searching for several different websites! 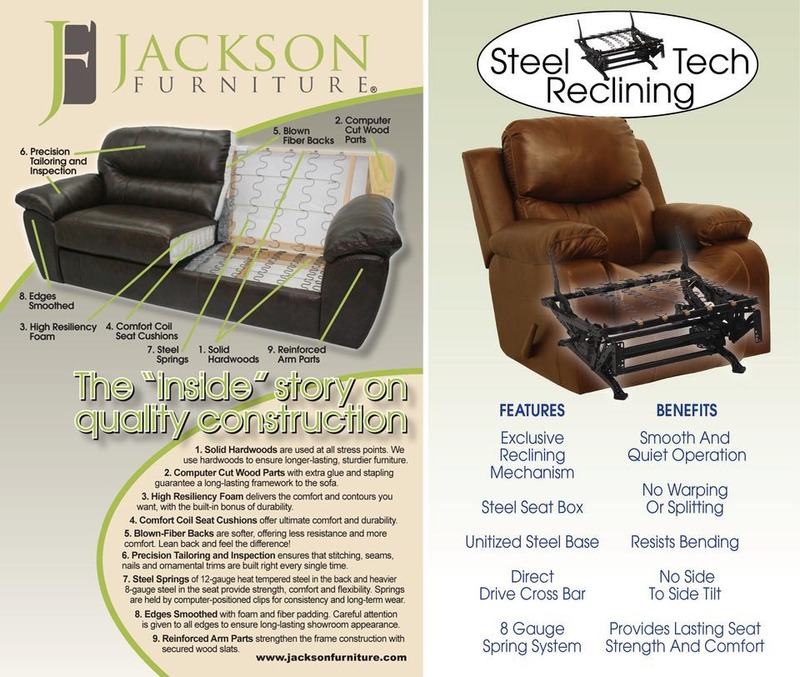 Today we’d like to feature Jackson Furniture as well as their reclining furniture brand, Jackson Furniture. Born in 1903, Mr. Ray Jackson left very humble beginnings in Cleveland, TN to set out on his own at age 16. After working for several years in an auto assembly plant in Ohio, he returned back South to Tennessee to try the chair upholstery business. After quickly learning the upholstery craft, he took the $30 in his pocket—ALL that was left after the banks closed during the Great Depression and started Jackson Furniture Company. The business grew and grew with expanded factories and more people hired and put to work. His $30 gamble paid off as by the 1970’s, he had over 1.3 million square feet of furniture manufacturing space in TN, MS, TX, and FL and was one of the largest family owned furniture enterprises in the USA. His greatest turning point was determining the assembly line production of Platform Glider Recliners was the key to a “comfortable America”. He took the knowledge from the automobile industry and applied it to Chair/Glider production. These same techniques are still used every day in the plants as the culture still thrives under 3rd generation leadership. Mr. Jackson would often comment that much of his success came from good old fashioned hard work and a dedication to giving employees an opportunity to “better themselves”. Today, Jackson Furniture remains focused in the USA. They have over 4 plants in the USA along with thousands of employees and vendors committed to producing the most comfortable and longest lasting furniture that money can buy. Their sole focus is on the living room—they have been specialists in fashionable, comfortable sofas and recliners for over 75 years adding along the way, professionally designed tables and rugs to complement their seating products. Have a look below at their quality construction!